How do I even begin to describe last night? It was truly a night to remember. My daughter found the most amazing man to become her husband. We could not possibly be happier. What better way to celebrate my daughter's marriage than to have plenty of food, drink and laughter. Yup. We had it all! Oh, and did I mention an abundance of LOVE? You have to know something about me.....I seldom order fish in a restaurant, unless I'm on a strict diet. Tonight, I had no desire to be strict, because I was in the midst of a celebration. We met my daughter's fiance's family for dinner, the night before her wedding. We went to Lucque's, the restaurant her "husband to be" took her to on their first date. The ambiance was beautiful, the food was amazing, and the blend of our two families was perfect. So, although I gave myself permission to have a two day hiatus from my diet, I still went with the fish, because I knew it was lighter than ordering meat. My tastebuds got a wonderful surprise! The barramundi was indescribably delicious! And it shouldn't affect the fit of my Mother of the Bride dress! As I said before, I've got lots going on!!! One of my weight loss goals was to be able to walk down the aisle at my daughter's wedding without the embarrassment of being fat as Mother of the Bride. Hmmmmm, didn't quite make it. My daughter got engaged last week, and has already planned her wedding for next weekend. Doesn't really give me enough time to reach my goal, does it? That's okay. I'm so excited for her. Last night we went to dinner after bridal gown shopping. I ordered a spinach salad with shrimp, grapefruit and cashews. Notice her diamond ring sampling my meal? I have tons going on right now, and it's hard to understand a new diet on top of everything else that I am doing. But, I am trying! Long story short, I don't even know if my protein pancake is allowed for breakfast. I think it is allowed on the high carb day, but I'm not sure yet if bananas are allowed on the low carb day. I'm too busy to really check it out. Another problem is fitting vegetables in at every meal. I understand having them at every meal except breakfast. I love my protein pancake so much that adding vegetables to the meal is a little awkward. Oh well, for now, I made myself a protein drink with spinach. At least I know that I got my protein and veggies in. Hopefully, I will have some time later tonight to read all about this diet. It's still early, but I am starting to learn about a new way to lose weight. Featured on the television show, Extreme Weight Loss, Chris Powell and his wife, Heidi have had much success helping people lose weight. Hopefully, by reading their book, they will help me. I almost didn't write this post today, because I have not set up my link to allow my readers to buy this book. (I'll do it soon Leo) but, I am so excited about starting this plan, I decided not to wait. The idea behind carbohydrate cycling is to eat a high carb diet one day and a low carb diet the next, so that you trick your body into burning more calories. You are also required to eat 5 meals a day, with protein and vegetables at every meal. I think this will bring the biggest improvement to my weight loss. I know, believe it or not, I have not been eating enough throughout the day. I had a moment of clarity today. I've put a lot of time and effort into losing weight, yet I am still overweight. It would be understandable if I started out at 500 pounds, but I didn't. So, why am I still fat when I've been at this so long? I still have not made losing weight a real priority. Sometimes the small meals I eat may actually be sabotaging me. Quite often, because I am unprepared, I don't even eat enough. Lunch today is a good example. 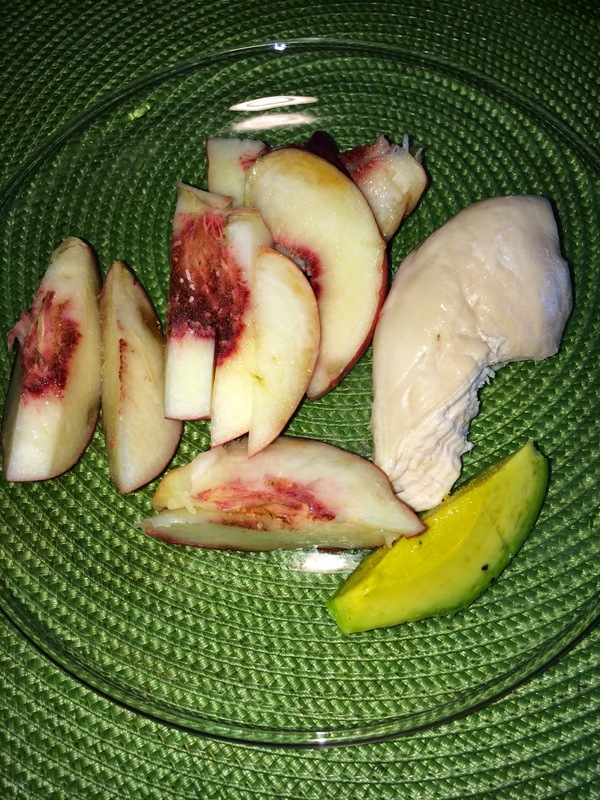 The lunch I took to work consisted of a little boiled chicken, a peach and a slice of avocado. I was low in calories but that's not enough to keep my body running at a fat burning level. Hopefully, this is about to change. Tomorrow I will tell you about a new diet I am embarking on. Stay tuned. Most of the reading I've done lately, advises eating 5 small meals a day. This helps to keep your metabolism going, and keeps you from getting too hungry. I did not follow that advice at all today. I had one great, really delicious meal, and I hope I didn't do too much harm. I can't imagine that I did. I stayed way within my calorie allotment for the day. We took my mom out for a late lunch, early dinner. We went to South Beverly Grill where I had the "Jungle Thai salad". It usually comes with noodles, but I ordered it without noodles and extra lettuce. So good!! !